More than 100 industry, education and government representatives gathered on May 25 in Waterloo for the official opening of the new, 12,400 sq. ft. Conestoga/OIRCA Roofing Skills Training Centre, a project of Conestoga and the Ontario Industrial Roofing Contractors Association. In order to promote economic development, increase educational opportunity and help the institution grow to meet employer needs, Conestoga has received federal and provincial funding totalling $72 million for new and expanded Conestoga facilities in Waterloo, Kitchener, Cambridge and Guelph, through the Knowledge Infrastructure Program and Ontario's 2009 Budget. The Knowledge Infrastructure Program (KIP), a two-year, $2 billion economic stimulus measure to support infrastructure enhancement at Canadian post-secondary institutions, is part of the $12 billion in new infrastructure investment allocated under Canada's Economic Action Plan. The KIP is providing real economic stimulus and employment by creating local jobs for engineers, architects, tradespeople and technicians. It is also helping to generate the advanced technological infrastructure needed to keep Canada's research and educational facilities at the forefront of scientific advancement. Speaking at the May 25 event, the Hon. Gary Goodyear, MP for Cambridge, Minister of State for Science and Technology and Minister of State responsible for the Federal Development Agency for Southern Ontario, said, "It is clear that colleges, with their many strengths, are deserving of federal funding support. Our plan is not just to create jobs for today, which KIP projects certainly do, but also to create the better jobs of tomorrow. All this is possible because of all levels of government working together - federal, provincial and municipal." 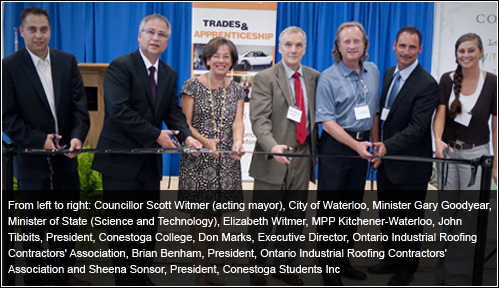 "The opening of the new Roofing Skills Centre at Conestoga College is a marvelous example of our community building and growing together," said Leeanna Pendergast, MPP for Kitchener-Conestoga. "This timely collaboration is meeting an important industry's need for highly skilled tradespersons who will train at this state-of-the-art facility. The Ontario government is very pleased to make this significant commitment since it will undoubtedly lead to immediate job creation and strengthen our local economy for many years to come." The Government of Ontario, in its 2009 budget - Confronting the Challenge: Building Ontario's Economic Future -- is committed to investing in infrastructure and has designated $780 million to colleges and universities to modernize facilities and boost long-term research and skills training capacity over the next two years. The Conestoga/OIRCA facility is at Conestoga's Waterloo campus site and sits adjacent to the Conestoga/OMTC Masonry Training Centre, which officially opened in the spring of 2009. The roofing facility features two spacious classroom areas, a large shop area presenting space to work on a number of roofing skills projects employing various techniques, and an outdoor, canopied project work area. Its opening marks another step in Conestoga's goal of creating at Waterloo a centre of excellence for construction trades skills. The main campus building in Waterloo also houses Conestoga's many culinary skills programs, and students from those programs prepared and served all the refreshments at the May 25 event. Conestoga President John Tibbits told the event audience, "We've had excellent partnerships with industry and government in creating these training centres for masonry and roofing skills. It's worth noting that these projects have been completed on time and on budget. The benefits from these projects and others now underway at Conestoga include not only the considerable person-hours of work created in our communities, but also the imparting of high-value skills education for those communities and the expansion of learning opportunities to many thousands of additional students." Ontario's roofing industry is currently facing a significant challenge due to a lack of skilled tradespeople entering this profession. This multi-disciplinary trade, which blends principles from design, architecture, engineering and various forms of construction, requires highly trained individuals to master modern project delivery. It further requires a significant bridging of knowledge from current practitioners to newly trained professionals, who are well versed in the use of the latest materials and techniques. On behalf of OIRCA, Executive Director Don Marks stated, "The key to a strong economy for our future lies in the college system. I feel that the Waterloo campus will become a major portal for the future of our industry-whether through young people discovering an excellent career option, students seeking new directions through initiatives like Second Career, or the improvement of skills for those already employed in the trade."